On Friday, Sept. 21, TEDxWLU took place at Laurier’s Senate and Board Chamber. This year’s all-day event was independently organized by students and featured nine guest speakers, three TED Library Talks, as well as a networking event in which students and guest speakers had the opportunity to connect. The event’s lead coordinator, Sulay Shah, is a third-year BBA and Computer Science student. 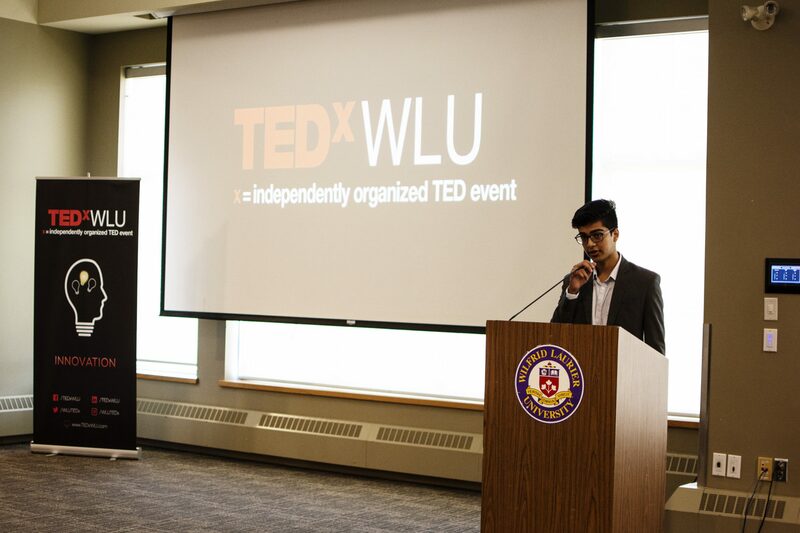 Shah utilized his passion for innovation and admiration of TED talks to bring the event back to campus and provide Laurier students with the opportunity to connect with successful innovators, entrepreneurs and motivators. TEDx has been previously brought to Laurier, back in 2011 and 2016 at the Waterloo campus, as well as last year at the Brantford campus. The theme for this year’s TEDxWLU event was innovation, in which each speaker was allotted 15 minutes to share their wisdom and experiences with a young and curious audience. The event’s lineup of guests was successful in providing a wide diversity of talks that ranged from mental health awareness to philanthropy. Before lunch, TEDxWLU hosted the CEO of Trufan, Swish Goswami, the CEO of ApplyBoard, Martin Basiri, Keith (Mac Gives) Diaz — a.k.a. “the Modern Monk” and founder of “KickStart Your Work,” Kalyna Miletic. Afterwards, attendees heard from professor of physics and computer science at Laurier and faculty advisor of Women in Science Shohini Ghose, professional consultant and vice president of marketing at Lenbrook June Ip, managing director at OCAD University Kevin Morris and former NBA player Carrick Felix. Sulay and his team of coordinators had been working hard on getting the event together. Budgeting was crucial to provide the students and guests with lunch, which was catered by Shawarma Plus, and refreshments including a selection of hot beverages from David’s Tea. TEDx is a program facilitated by TED that allows independent organizers to curate their own TED events. “You basically have to apply to TED and they’ll give you a one-time license that you can reapply for … you have to follow the rules they give you,” Shah said. All of the speakers who were featured at the event volunteered their time to speak and attend the networking event and all seemed eager to connect with our student body. The event offered 100 tickets for sale in which they sold nearly all. Students of Laurier were offered tickets for a discounted price of $20, rather than $30. “I think it went decently this time and I plan to do it again next year. I would like to make it an annual event,” Shah added.